Chris B. Leyerle: Why is the Middle Class Shrinking? Why is the Middle Class Shrinking? ~ Or does one of the major parties not like middle class attitudes? 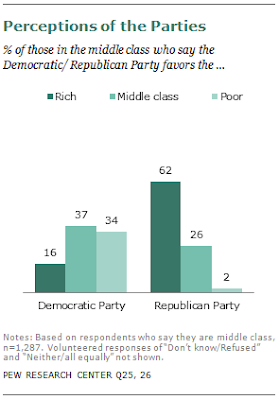 The middle class thinks the GOP favors the rich, a rather inconvenient perception for that party. Their solution is pretty neat: insist that helping the rich will also help the middle class, and then push for endless and disproportionate tax cuts for the rich while gutting social programs and tax benefits that matter more to the middle class. By the time enough of the middle class figures out that the GOP is sticking them with trickle down, supply-side voodoo, they'll no longer be middle class. Well, How Did We Get Here? "So, What Are You Doing?"